Think most email marketing practices won’t work for coaching professionals? We know that your business is about selling high-value services and building relationships, not promoting products. So if you’re looking for resources to skyrocket your coaching practice, check out GetResponse, with all the communication tools you need to create a vibrant coaching business that delivers results. Capture more and more followers. Use online tools to interact with prospects that are ideal for your business and explore new ways to grow your list of contacts. Offer a lead magnet such as a free e-book or guide and watch your list becoming a source for business. Automate your onboarding communication to build relationships and continue the conversation. 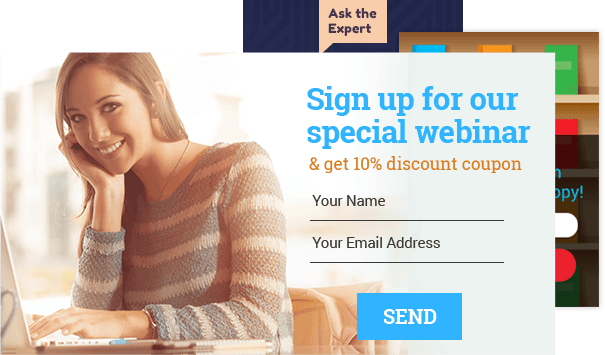 Offer a free course to engage prospects, complete with video emails, scored tests, surveys and more. Assign scores and reward your readers’ engagement with exclusive content or a special gift. 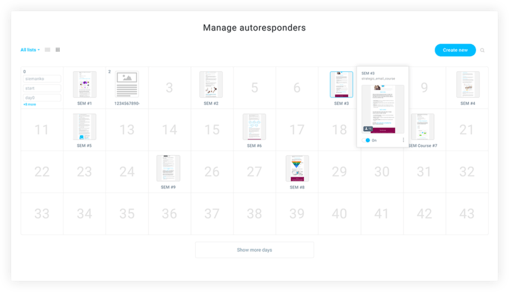 In addition to one-to-one access, provide your clients with in-depth, tailored content delivered by email on autopilot. Offer unique whitepapers, reports and guides exclusively for your contacts. Send more than just text: videos from your lectures or image collections from conferences. Create automatic alerts with new publications, upcoming events, and industry news. Share frequent lists of the most popular articles, blog posts and downloaded resources. 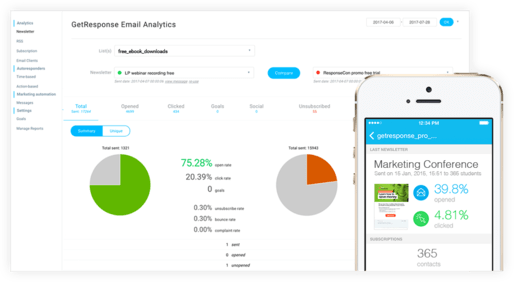 View campaign performance on at-a-glance charts and use A/B tests to find out what makes contacts click. Turn your content into an education center and secure your status as an expert. Create a search-friendly online directory of your newsletters to attract and educate prospects. 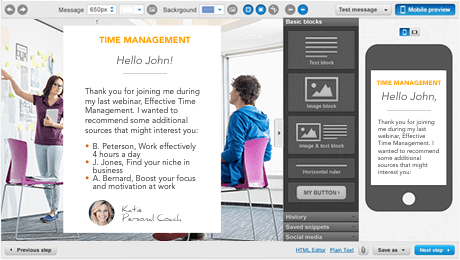 Send automatic reminders for webinars and teaser classes, including downloadable outlines and handouts. Run online courses and administer scored tests by email to find out how well your clients absorb your lessons. Move clients from one training module or content campaign, into another automatically, based on their growing proficiency or changing preferences. Build custom communication flows based on what content your contacts click, view or download. Your readers need to like your personal approach, personal views and perspectives — they need to like YOU. Set automated welcome campaigns for your new subscribers to ask how often they would like to receive updates, what they’re looking for, or to give them a few course kickstart tips. Introduce yourself in video newsletters to give prospects and clients a face-to-face coaching experience. Get more personal – assign tags, segment your audience and send different articles depending on their age, location, industry or individual preferences. Raise the bar in the business. Exceed your goals and use clever tactics to quickly turn your prospects into loyal customers. Spread the word online — announce your upcoming newsletters on Facebook, Twitter or LinkedIn with just one click. Create gated content and offer it as paid a course delivered via email over time. Get yourself in front of your virtual audience, but first let them quickly subscribe to your webinars. Adapt to your worldwide customers and send them drip content at the same local time automatically. Your name represents your brand, so start building its reputation. Create landing pages featuring case studies, testimonials, and projects you collaborated on. Build online surveys to find out whether your content meets your readers’ expectations. Send video recommendations from your business partners, other coaches and friends. Use social media integrations to solicit feedback on Facebook, Twitter and LinkedIn. Connect with your audience via webinars. Nothing builds trust more than giving your brand a face and voice. 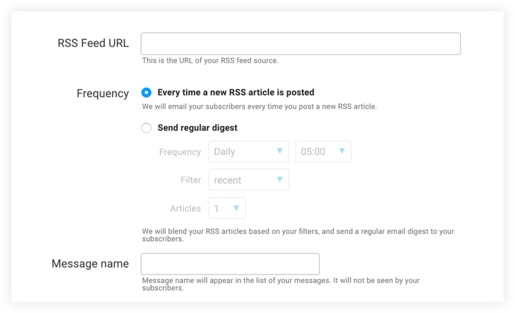 Respect your subscribers time – automate message timing based on their preferences. Once a week, twice a month – not a problem at all. Can you afford to miss the 55% (Litmus "Email Analytics", March 2016) of email users who check their email on mobile phones? Increase readership with responsive email designs that contacts can view anytime, anywhere, on any mobile device. 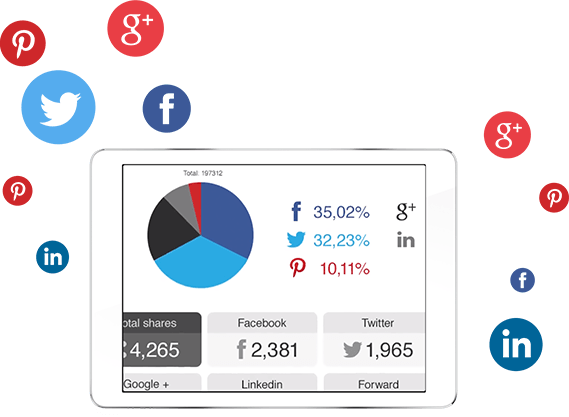 Use your tablet or smartphone to drill down from global stats to individual contacts. Create mobile-friendly landing pages for your offerings where mobile users can learn, try, and buy. Add the power of GetResponse to your business. Your clients will love the incredible campaigns you create using GetResponse. 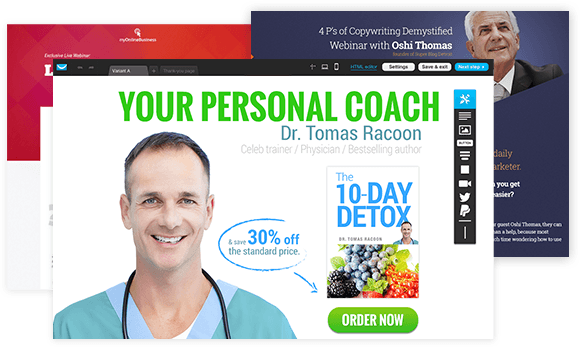 Find out how our platform can add power to your online coaching practice and boost your business success.